ALAB Pilipinas claimed its second straight win at the expense of the Kaohsiung Truth, 93-87, on Sunday in the Asean Basketball League at the Olivarez College gym in Paranaque City. 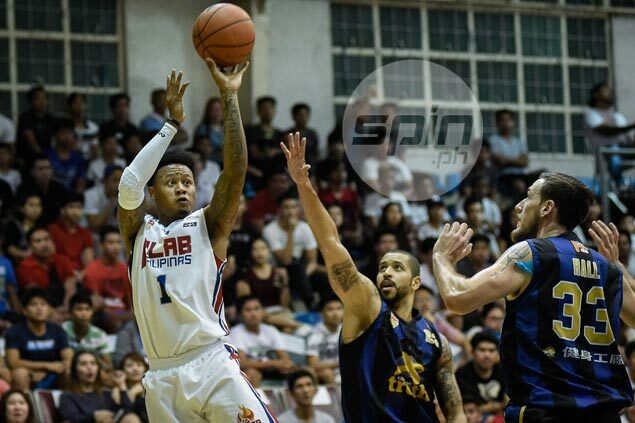 Ray Parks spearheaded Alab's attack, scoring 41 points as the Philippine side claimed their second consecutive win against the Taiwanese side. Parks notched his second 30-point game in a row for Alab, which beat Kaohsiung, 91-82, last week in Baliwag, Bulacan. Alab raised its record to 2-1 (win-loss) for third place in the team standings behind Hong Kong Eastern Long Lions (4-0) and opening-round tormentor Singapore Slingers (3-1). Former Far Eastern University standout Raymar Jose made his debut with the Truth but couldn't help his team in the crucial moments after fouling out with less than five minutes left. Jose finished with 12 points and seven rebounds for the Truth, who also got four points and eight assists from fellow Filipino import Achie Inigo. Lee Seung Jun had 24 points for Alab, which used a 10-0 spurt in the fourth period to pull away for good after the Truth closed in at four points, 64-60. Imports Cedric Oliver and Derek Hall finished with 23 points each for the Truth. Alab Pilipinas (93) — Parks 41, Lee S.J. 24, Lee D.J. 8, Celiz 7, Domingo 4, Cawaling 4, Hubalde 3, Fortuna 2, Knuttel 0, Acuna 0, Thiele 0. Kaohsiung (87) — Hall 23, Oliver 23, Jose 12, Luo 10, Lin 5, Inigo 4, Chang 3, Hsu 3, Ku 2, Andrade 2. Quarters: 23-15, 40-32, 62-52, 93-87.